Donald Trump’s National Security Advisor John Bolton is expected to announce the closure of the Palestine Liberation Organization (PLO) office in Washington DC, in addition to challenging the legitimacy of the International Criminal Court. The move comes in the wake of a refusal by the Palestinian Authority, which is the institutional form of the PLO, to bow to US pressure and accept a ‘peace deal’ that would destroy Palestinian rights and sovereignty. A copy of the speech to be given by Bolton on Monday was leaked to the Wall Street Journal, which reported that it contained several inflammatory statements against the Palestinian people and the International Criminal Court (ICC). Bolton is expected to give the talk, entitled “Protecting American Constitutionalism and Sovereignty from International Threats,” to the Federalist Society, an ultra-conservative group in Washington D.C. The censure of the ICC involves a recent threat that the U.S. could be charged with war crimes for its invasion of Afghanistan. 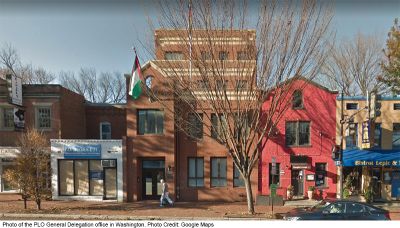 The PLO opened the representative office in Washington D.C. in 1994 as part of the Oslo Accords, which were the results of years of direct peace negotiations between the Israelis and Palestinians with the U.S. as the broker. But instead of bringing peace, critics say the Oslo Accords were used by Israel as an opportunity to expand their territory onto Palestinian land and to transfer their civilian population onto land seized by military force, in direct violation of the Oslo Accords and the Fourth Geneva Convention. The closure of the PLO representative office appears to be the latest in a series of pressure tactics used by the US against the Palestinians to force them into an agreement with the Israeli government that would deny them a state, as well as denying the right of Palestinian refugees to return to their homes.